Don’t dabble with GAL settings. Either leave the configuration alone, and just let Outlook users see the Default Global Address List; or else, take the time to study, plan, and test before you implement custom Address Lists. 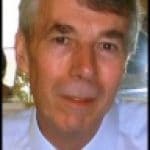 What is the Exchange 2010 Global Address List? What Happened to RUS in Exchange 2010? A directory service for Outlook users to find email addresses and distribution lists. THE phone book for email. An inventory of all Exchange 2010 objects. The mother of custom Address Lists. Some people refer to the GAL as the Global Address Book (Rather than List). Expand the Organization Configuration (Key point). Click on the Address Lists tab. Once you realize that there are a handful of built-in Address Lists, you soon realize that you could create your own Custom Address Lists. However, be careful, don’t create too many lists, and furthermore, give thought to meaningful names for your lists. The situation, you want to modify the GAL, however, you discover that you cannot edit (or delete) the Default Global Address List. This is the master list of all the Exchange 2010 objects, and the operating system won’t let you mess with it. Fortunately, there is a well respected work-around, create a new Global Address List, and then ‘update’ the mailbox. This procedure has its own PowerShell command. As an alternative to clicking in the Exchange Management CONSOLE, you could type commands in the Exchange Management SHELL. Using cmdlets like those below will save you time, more so when you realize that every Exchange 2010 configuration task has a faster command-line equivalent. Furthermore, certain commands are ONLY available in the Shell, for example, new-GlobalAddressList. As a learning progression, by all means start with GUI Exchange Management Console, but note as each Wizard completes so it shows you the corresponding PowerShell commands. Why not save these so that in future you can use the cmdlets in the Shell? Note 2: There is another family of cmdlets without the word ‘Global’, their noun is plain ‘AddressList’. Important: Firstly, you have to use PowerShell to create your new Global Address List (There is no equivelent command in the GUI). Secondly, once created, you can only edit it with the set-GlobalAddressList cmdlet. Help with error message: ‘Access to address list service on all Exchange 2010 servers has been denied’ try the following. a) Simply repeat the command! It worked for me, also maybe try a different name, I tried "Worcester2" the second time I ran the command. b) Check the Services snap-in. Are all the Exchange services running, e.g. System Attendant? c) Revert to the old trick of rebooting the server, maybe it has just received a ‘Patch’ or update. The situation, you have created and defined a new Global Address List using the above cmdlet. Note 3: If you don’t get the required result either create a new Global Address List, else use set-GlobalAddressList to modify the one you created earlier. Here is syntax that I used after I deleted the old GAL manually using ADSI Edit. update-GlobalAddressList -Identity "Default Global Address List"
Begin with a clear idea of what you want to achieve with a custom address list. Presumably, making it easier for Outlook users to find addresses ranks high on your agenda. If you are doing this task for real, as opposed to just learning about Exchange 2010 Address Lists, then involve at a cross-section of users before you design a complex, multi-levelled, address list scheme only to find that the end-users hate it. Good news, behind the scenes Active Directory changes the members of the list dynamically based on LDAP queries. Let me emphasise that these are simple Address Lists (There is no ‘Global’ word here). Note 1: There is another family of cmdlets without the word ‘Global’, their noun is plain AddressList. The situation, you have created, and defined a new Address List using the Exchange Management SHELL. Note 1: ‘Students’ is the name of the Address List. All Users\Campus is a sub-folder. That’s it! This is why people use PowerShell instead of the GUI! To be fair, you need to run the cmdlet below to see the names of possible Address Lists. Again, to be fair, everyone takes a peek in the GUI the first time they configure an item; it’s for the repetitive tasks that PowerShell saves times. Here below is an alternative to PowerShell. Before you ‘Apply’ your Global Address List you may like to click on Edit, the benefit is that you can check, and if necessary, edit the settings. Select the particular Address List that you want. The Apply Address List wizard should launch. At the following time (If the server is busy). Quite frankly, RUS was slow and cumbersome, so he won’t be missed now that his role has been incorporated into Exchange 2010. Exchange 2003’s RUS (Recipient Update Service) has been replaced in Exchange 2010 by two PowerShell cmdlets, update-AddressList and update-EmailAddressPolicy. Thus, don’t go looking for RUS in Exchange 2010, instead launch the Exchange Management Shell and experiment with ‘Address’ family of cmdlets. 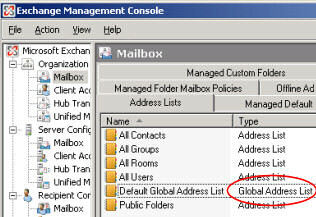 Exchange 2010’s E-mail address policy generates email addresses for your users, contacts, and groups. This is important, for without an address nobody could send or receive emails. 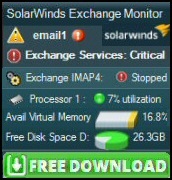 The killer reason to configure this setting is to adjust the way that email addresses display in the Exchange 2010 GAL. For example, small companies display email addresses as FirstName LastName, whereas large companies display prefer, Lastname, Firstname. 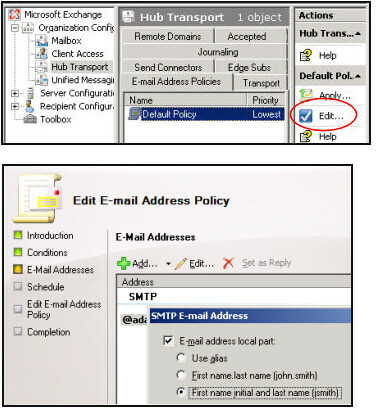 It is small companies who are exapanding that need to change their Email Address Policy, this is how you can adjust the Exchange 2010 GAL settings. 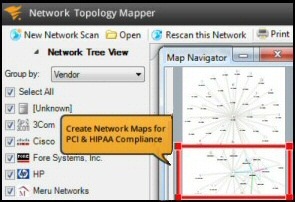 Select the Hub Transport node (Key point). Click E-Mail Address Policies tab. Select the e-mail address policy that you want to edit. In the Actions pane, click Edit. On the Introduction page, review the name. 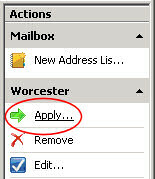 Select the condition(s) Use this section to set one or more conditions for your e-mail address policy. If you do not want to set any conditions for the policy, do not select any of the check boxes. On the E-Mail Addresses page, select the e-mail address, and then click Edit. Principles and techniques that you learned with other Exchange 2010 ‘Address’ names, will be useful for the Offline Address Book. Please take note, this is not the Global Address Book. Right-click on the Default Offline Address Book. Tick the box: Include the following address lists. Make your selection of Address List(s). Note 2: There is another family of cmdlets, their noun is OABVirtualDirectory. Where Exchange 2010 and Exchange 2003 coexist, you can edit the GAL or the Address List objects from either Exchange 2003 or Exchange 2010. However, there are two ‘gotchas’; firstly, you must upgrade Exchange 2003 objects before they can be edited by Exchange 2010. Secondly, if you do upgrade the object, then you cannot edit it from Exchange 2003.